The Hawk-Woods V-LOK range of battery chargers are fully compatible with the Sony V-Mount and can be used with any V-LOK battery. 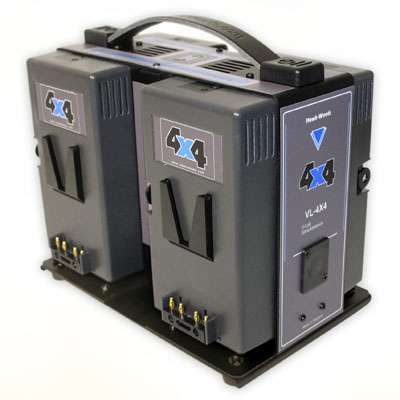 To pack a power punch into your charging needs the Hawk-Woods 4x4 is a 4 bay simulation battery charger, will charge four 100 watt lithium batteries in under 3 hours making this a on the run solutions giving you enough battery time for all day and night shooting. We also stock Model VL-100’S which are travel safe. If your requirement is for higher power the Hawk-Woods manufacture 140, 170 & 190 Watt V-LOK Batteries.